Saving your own seed can be economical and fun, and was once common practice on homestead and commercial farms. Many modern combines have the ability to separate out most weed seeds and grain chaff, though further winnowing after the harvest will improve the quality of the grain seed. Seed cleaners will help to turn dirty, chaffy seed into high-quality grain seed for the next year. The machines have a series of screens to sift out larger and smaller objects from the desired grain seed, and as the cleaner shakes back and forth, that unwanted material is sifted out. At the height of wheat and grain production in the northeast, most farms probably had their own mechanical seed cleaner; now it may be more difficult (but probably worth it) to locate that service. Growers who save a great deal of their own seed for the following year may want to invest in a seed cleaner. For more information on saving your own seed, visit Seed Savers Exchange. Hand Pollination: The Northern Plains Sustainable Agriculture Society Farm Breeder Club is helping members with their own on-farm breeding projects. They have developed two videos on hand pollination, which is necessary for keeping seeds of some varieties and a critical step in the breeding process. A very little considered alternative farm-scale grain processing activity is the growing, cleaning, and marketing of seed. Seed production is not difficult, but requires the following of strict protocol in order to insure varietal purity. The process starts in the field with planting pure seed, isolated from other crops. The combine must be thoroughly cleaned between crops and harvests need to be segregated. Augers and elevators must be cleaned. Cereal crops are definitely the easiest to process. 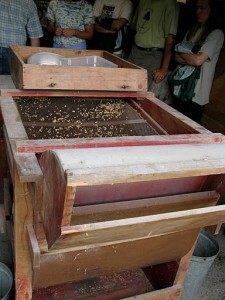 A properly adjusted and outfitted fanning mill is really the only piece of equipment required for basic seed cleaning. A gravity air separator table can be employed as step two in the process. Public varieties of various grains are really the only ones that can be cleaned and sold from the farm. It is very important to check if a particular variety is “PVP”-Plant Variety Protected. Farmers in Vermont want basic seed. There is a very high demand in the spring for seed oats and in the fall for rye.